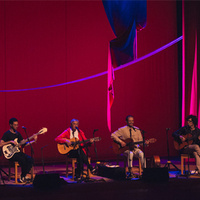 For over 35 years, Grammy Award-winner Caetano Veloso has been a major musical, social, and cultural force in Brazil. The New York Times calls him “one of the greatest songwriters of the century.” Veloso’s latest project is a collaboration with his sons: Moreno, Zeca, and Tom. This legendary lineage performs an intimate, acoustic concert full of their favorite songs like “Um Canto de Afoxé Para o Bloco do Ilê,” and your favorite songs of Veloso’s like “Cucurrucucu Paloma,” “Sozinho,” and more.